Our 25th Anniversary Winter Camp is getting closer and we are getting more excited for this amazing training opportunity. Below please find the schedule of events, including our first-ever winter beach training session with Sense Kobayashi! (Anyone who’s participated in our annual Beach Trainings that take place in July can tell you how much fun these are). 23rd – 28th, 2018 atthe MSKC dojo, and all JKA members are invited to attend. Sensei Kobayashi is a 7th dan with the JKA and teaches at Hombu Dojo in Japan. He has lead training camps at Miami Shotokan several times and classes fill up quickly. To RSVP, please call (305) 978-4302, visit us at the dojo or email MiamiShotokan@gmail.com. Each day will feature multiple classes that focus on different Kihon, Kata and Kumite. Traveling to our camp? Make sure to book your room at the Best Western during your stay. Who’s ready for a movie night? Parents, are you ready for a night out without the kids? 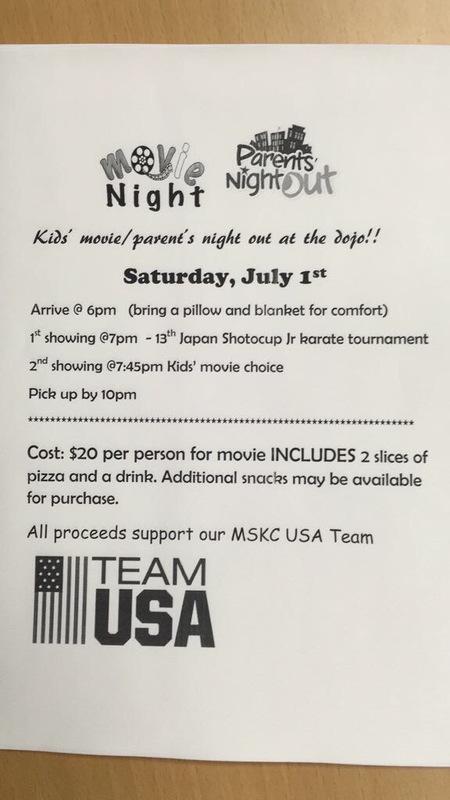 Then bring your kids to Miami Shotokan on July 1st for kids’ movie night! We’ll be showing two movies – the 13th Gichen Funakoshi Shotocup’s junior tournament AND another movie of the kids’ choice. The cost is $20 per kid and includes two slices of pizza and a drink. Proceeds from this event goes towards our fundraising for the US Team. We ask your help in supporting Team USA! This year some of our dojo members have been selected to represent the US Team at the Funakoshi Gichin Cup 14th World Karate Championships being held in Limerick, Ireland this August. Because the trip’s expenses falls to each individual, Miami Shotokan is holding a fundraiser to support our members. For a limited time, we are selling team USA 11″x18″ microfiber towels for $10. You can pre-order them in blue and/or white through July. * Due to limited resources we will only be able to ship within the United States — with Shipping & Handling added to the cost. * Local purchases can be picked up at the Miami Shotokan dojo. * Delivery can be arranged for those attending the upcoming JKA/AF Summer Camp this June in New Orleans. Please call Miami Shotokan at (305) 978-4302 to order yours now! Go Team USA! Thank you for a great Winter Camp! Miami Shotokan would like to take this opportunity to thank everyone for their part in the success of our 23rd Anniversary Training Camp. First and foremost, we’d like to thank Kobayashi Sensei for an exceptional training camp! Thank you for sharing your knowledge, commitment and true karate spirit with us this week. We’re already looking forward to the next one! To all of our dojo family and friends for joining us and making this an exciting and fun-filed week of camaraderie and hard karate training! And, special thanks to our dojo members who volunterred their time and talents to help make this a successful training camp. We are so appreciative of your dedication and help! Winter Camp is only a month away and we are getting excited for some great trainings with Sensei Kobayashi! As our annual training camp gets closer, we’ve made some updates to the schedule to include more classes on Saturday, January 28th. Miami Shotokan’s 23rd Annual Winter Camp is getting closer! 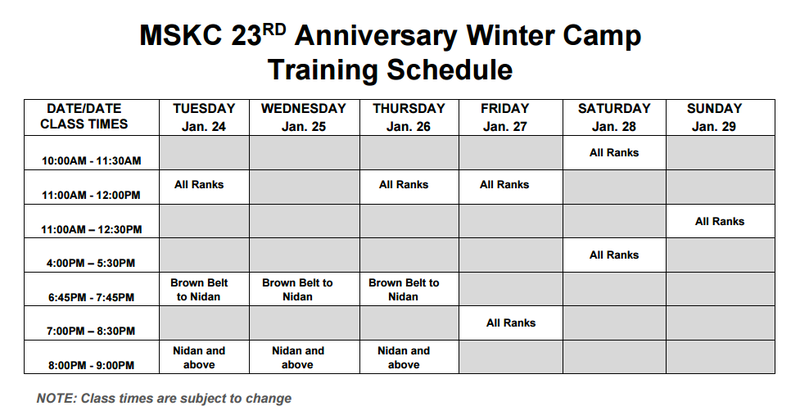 We are excited to share the schedule of trainings, led by Sensei Kobayashi from January 24th – 29th. Click here to reserve a room. We look forward to training with you! Don’t miss Miami Shotokan’s 23rd Anniversary Winter Camp with Sensei Kobayashi. The camp takes place from January 24th – 29th, 2017 at the MSKC dojo, and all JKA members are invited to attend. Sensei Kobayashi is a 7th dan with the JKA and teaches at Hombu Dojo in Japan. He has lead training camps at Miami Shotokan three times and classes fill up quickly. To RSVP, please call (305) 978-4302, visit us at the dojo or email MiamiShotokan@gmail.com.